Panasonic has introduced the LUMIX GH5S at CES 2018. Featuring a new 10.2-megapixel High-Sensitivity MOS sensor, the mirrorless camera is designed for pro filmmakers and photographers, and puts even more focus on video than last year’s GH5, while capturing high-quality stills, as well. (Check out the Panasonic GH5 review here.) Look for our hands-on testing of the GH5S soon. 4K 60p video recording in Cinema 4K (4096×2160), internal 4:2:2 10-bit video recording up to Cinema 4K30p and internal 4:2:0 8-bit Cinema 4K60p. Optional accessories, sold separately, include the Battery Grip DMW-BGGH5 for extended battery life and a better grip and the XLR Microphone Adaptor DMW-XLR1 for capturing superior sound with an external XLR mic. 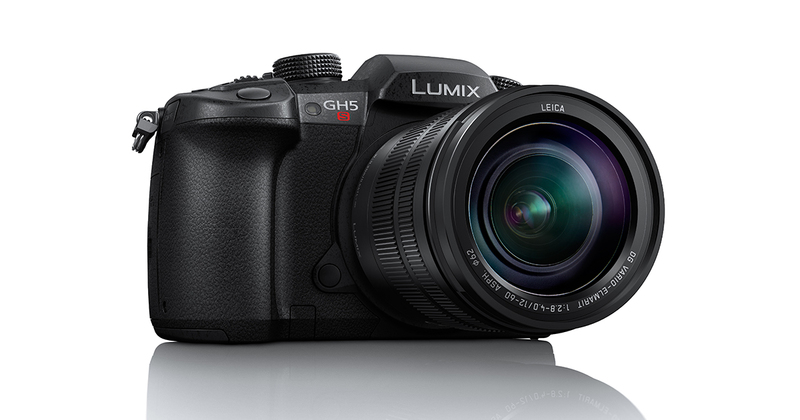 Las Vegas, NV (January 8, 2018) – Panasonic is proud to introduce the new hybrid Digital Single Lens Mirrorless Camera LUMIX GH5S with expanded video recording capability and enhanced image quality. Designed and developed for professional filmmakers, the LUMIX GH5S achieves highest-ever image sensitivity and video image quality in the history of LUMIX cameras, especially in low-light situations. *1 RAW files are in 14-bit even when 12-bit is selected. *3 As of January 8, 2018 as a Digital Single Lens Mirrorless camera that complies with 4K (4096×2160) resolution defined by Digital Cinema Initiatives(DCI). According to a Panasonic study. *4 4:2:0 8-bit in C4K 60p and 4K 60p recording on an SD Memory Card. *5 Contrast AF with DFD Technology works only with Panasonic Micro Four Thirds lenses. *6 In AFS, at wide-end with H-ES12060 (CIPA) when LVF display speed is set to 120fps. *7 Splash Proof is a term used to describe an extra level of protection this camera offers against exposure to a minimal amount of moisture, water or dust. Splash Proof does not guarantee that damage will not occur if this camera is subjected to direct contact with water. *8 5GHz Wi-Fi is not available in some countries.